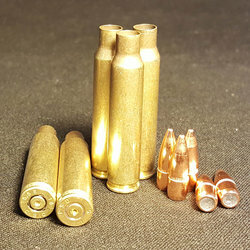 .223/5.56 Once Fired Brass and .224 Projectiles from DKB - 500 Ct.
Mixed NATO Headstamps only. Hornady projectiles. Processing Option: Casings will be deprimed, swagged, trimmed (1.740 - 1.760 length), deburred and tumble polished. Processing brass may take 1-2 days to ship out.